Viewing topic "You’ll all hate me for this but……." This point is aimed at Yamaha the Company and not the Keyfax/Yamaha guys who offer so much excellent support and to whom we are all indebted here. Why would a company of Yamaha’s stature not produce a fully functional Motifator web site from day one? Of course there will be bugs but can you imagine any commercial business accepting something as replete with bugs as this site from a team of paid web developers? We (a company in which I have an interest), have sub-contracted hundreds (yes hundreds) of web sites on behalf of our clients and I can tell you (given the financial resources one must assume Yamaha to have), there is no need for the vast majority of the problems we now see. I presume the Keyfax guys are producing this site as a a labour of love and all credit goes to them for giving freely of their limited and valuable time. However, Yamaha ought to spend an appropriate sum employing a team (or perhaps properly contracting/paying the Keyfax guys?) that can bring this site to live 95% functional. For the right team, this is not ‘Rocket Science’. The above is not based on opinion but real-world experience. This new Motifator site has been under development for months and as a professionally managed project should be (apart from initial bugs) fully functional by the time it goes live. ■ noted and solved the issue preventing us from seeing replies to our own posts. I repeat - these comments are not aimed at the guys who have done the hard work to get Motifator.com where it is now - but at the ‘powers that be’ who, (one can only conclude), have seriously under-resourced this project! PS This site has always been a wonderful reference library for most of those who use it. How can a new site with all the old content missing be considered an improvement in any shape or form?! PPS Sorry (once again) to be the guy saying “The emperor’s got no clothes on” but in this case, he is clearly..........Stark Bollock Naked! ZR you are right - I am not being disrespectful to any individual here. Given the time and resourses available, I am certain every single person involved has given his/her best. However, please read my post and tell me with which points you actually disagree. Of course my points are not aimed at “the guys putting all the hard work into this site”. They are aimed at the guys managing/employing “the guys putting all the hard work into this site”. I would guess that “the guys putting all the hard work into this site” would have wanted a little more time to soak-test the site before going live. I would guess that, given the choice, “the guys putting all the hard work into this site” did not want to go live with all the old content missing. My main point is that bearing in mind the amount of money each person here has spent on Yamaha products (not to mention the loyalty displayed staying with mLan etc therough less-than-perfect times), we actually deserve Yamaha giving “the guys putting all the hard work into this site” a bit more corporate muscle in order that the task runs as smoothly as possible and Yamaha’s loyal users get the site they deserve from day one. Surely you do not believe that the prodigious amount of work from Messrs. Clendeninn , Billias et al is entirely ‘pro bono’ – do you? I would be horrified to think all that wonderful input was rewarded only with thanks! I’m not sure how long you have been a member or participant of Motifator.com,but you should know that the site wasn’t put up by Yamaha. It was put up by some people who were “users” and, on some level, “advisors” or “consultants” who thought it would be a good idea to have a place where people could come and learn about the workstation and “how” to use it. 1...will take into consideration any and all constructive suggestions to fix and or improve the site. 2...are working as best as they can to see to it that it is the beneficial site it has been for, I think 7 years (I’m in my 6th). I was beginning to wonder when they would begin to make some changes. After all, there are 7 YEARS of data from posters along with various other aids to help inform the participants of the site on “how to”. Guys that have posted some 2000 times to say nothing of Bad_Mister and “The Jedi Knight”, DaveP, frankE,Brother Wellie,Sponge Bob and on and on. The data base had to be a bit crowded. It was probably time to expand the archives and make some adjustments for more gear and software and the support for it. To have taken on the task to redesign the site...AGAIN....maintaining all the existing info and make room for more deserves,at least, applause from “ME”. I’m sorry you are so uncomfortable. But here is a solution. DON’T chime in for about a week or two. Give them a chance to get the site up completely to suit “your” vision. I’m sure that by that time it will have an appearance to your liking. If not...oh well. In the meantime, I will be making as much effort as I have in the past to try and learn and be a help to others within the confinds of what presently exist. Ultimately, I think that’s what the site is here for and why I have been here all these years. Keyfax....I see you’re taking some heat over this. Not to worry. The people that really matter are behind you all the way. Do the best you can. You still got “TheDukester”. RE The people that really matter are behind you all the way. From a person who does not matter. If you would only take the trouble to read what I have said. you would not have posted this non-sequitor of a response. If this site is being put up voluntarily and freely by the Keyfax guys, then they are doing a sterling job. They have both my admiration and gratitude. PS It is good of you to think of me but I assure you I am not uncomforatable (as you so euphemistically put it). Thanks for all the feedback. We always welcome it. Boulez brought up three valid points of things that need to be done and he feels should have been done before the new site was launched. The reason this was not done immediately was because of the time that it takes to propogate the new site over the Internet. We had to have a cutoff date when the old forum became frozen and the new forum became active. So until that time we could not start the huge job of porting over the 1,000,000 plus posts on the old site to the new one. It was sort of a chicken and egg thing. However the plan from the beginning was to get all of this valuable information over to the new site as a priority and we are sure this will happen very, very soon. This is indeed a bug and a bothersome one at that. Our first post on the new site has over 2000 views and when logged in we also can’t see any of the replies, so we fully understand that this needs to be fixed. However again we couldn’t actually fully test the new forum system (chicken) until we shut down the old one (egg). Keyfax has put this particular issue at the top of their bug list. Again we anticipated that there would be some issues at first. As far as attachments are concerned, some people can and some people can’t so this is a much harder issue to trace. Most people seem to have no problem and the types of attachments and size of attachments are much better then the old forum software. But again we had to get the system up to have it tested under real world conditions and with a variety of different computer environments. There is a lot of cool stuff under the hood of the new site system that has yet to be revealed. So we simply ask for your patience and we will keep working to make the site better and better. Finally , there is Boulez main point about funding. Without knowing the details of how the site is funded and developed this may appear to be a reasonable statement. However the reality of the way Motifator works is far different. The world wide support that we provide on the this site comes at no charge to any of the members. 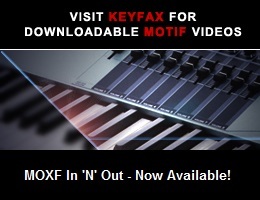 The development of the site is funded partially by Yamaha Corporation of America (with some additional funding from Yamaha in Japan), but primarily by Keyfax sales on the Motif Mart. No other Yamaha subsidiary worldwide contributes to the development of the site nor for that matter much in the way of support or posts. Many of the posts by YCA staff such as Yamaha US and Bad Mister are done on top of their already demanding schedules and outside of normal business hours. As you are posting from the UK, you enjoy the benefits of Motifator.com without having to pay anything for the funding of the development of the site itself or for the hours of time that YCA and Keyfax staff spend answering questions for customers worldwide. So what ever you think it’s shortcoming are, it is certainly worth every penny you pay for it. If you want to help fund development, please go and spend lots of money in the Motif Mart because that is the main source of revenue for Motifator. Motifator is not an official Yamaha site nor owned by Yamaha , but a community forum that is supported essentially by the forum members through their helpful posts and purchases in the Motif Mart. The powers that be would be ....you. It is support of the site, by the site , and for the site. Ahh sorry, Monday was President’s Day here in the US and we got carried away . Athan - How kind of you to bring some clarity to the situation. Re If you want to help fund development, please go and spend lots of money in the Motif Mart because that is the main source of revenue for Motifator. Noted - Will take positive action on this point both well made (and taken). Re It is support of the site, by the site , and for the site. Additionally, I unreservedly apologise for anything perpetrated by that nutcase George III. Can I just say - coming from a tech background myself - I started programming when I was 7 and have launched hundreds of websites myself. (quality not quantity). The websites I have launched were those involving anywhere from hundreds of thousands to tens of millions of database records. And I see nothing wrong with the way the move was performed. I think the site looks and behaves wonderfully. A few odd quirks here and there but nothing that I would throw egg at one for. Certainly bouelesez (sp?) you have heard of a soft launch? Since we are such a small community - consider this your soft launch. Case closed. Thank you for the Apostolic view and ruling you have made. It is indeed good of you to say unto us that the case is closed. As you are clearly speaking ex-cathedra, I have no choice but to observe that which you have decreed. Thanks for the clarifications on the various points raised here. Somewhere else in the forums some time ago, I read much of what you have said here. As new items for the XS are made available in the Motifator online store, I have purchased them all. As long as I have a job, I will continue to do so. It is a win-win situation in which we get cool add-ons for our Motif XS and we support the site and the individuals/companies that make these quality products available. I appreciate the work that has (and is) being done and have no complaints. My guess is that there are many like me around here. Thanks for all the great info Athan… I have to admit that I was feeling a bit like boulez used to, but having this info has totally changed my outlook and understanding of the situation… thanks for taking the time to clear things up! Agreed,Acts7! My apologies to boulez. And thanks also to Athan for the “refresher” on the source of Motifator. I have so much gratitude for the people who created and contribute to the site over the years. “I” can understand the frustrations of the crew of Keyfax trying to make such a massive transition and I don’t understand why “some” don’t “get” just how massive it is. Athan is right. For what we pay for the access and gains, we “shouldn’t” rail on this redevelopment. Then again, it’s like “TheBad 1” once told me,"People look for their ‘old’ axe in new gear”. Just to add my personal input to this thread (ok, so I’m not a huge post-count dude but I’ve been here for a fair while now). I was, and remain slightly critical of some design aspects of the site, but given that it’s work in progress and also given that it’s funded primarily by the keyfax sales (I’ve purchased my fair share of stuff, believe me), then I guess ideally we would expect Yamaha Corp. to provide more funding, but failing this then I can’t really complain per se about the site itself. It’s certainly beyond what I would personally feel comfortable providing on a shoe-string budget. Kevin, you keep on trucking’ dude :) We are a relatively small community but most of us are of artistic temperament by the very nature of our purchase/involvement here and as such you can expect some sentiment to be exhibited.